Four amazing distinct changes: First, four cards of one value (say the four Fours) are shown. They have blue backs. One by one each of these blue-backed cards turns face down. Second, all the cards change to red backs. Third, the faces all change to red suits. Fourth, the backs are now marked, each has a large X printed on it! Instead of the X's any message can be revealed. Requires three blank backed cards. 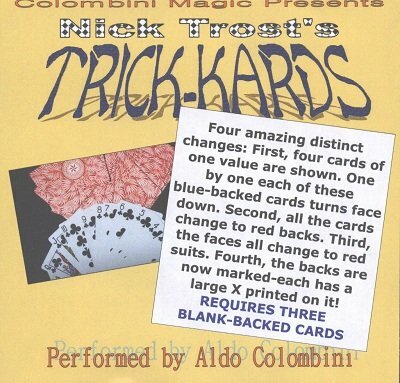 This is one of Nick Trost's best packet effects, wringing the maximum from what is now almost a standard twisting sequence. Can the cards be examined afterwards? No, but then, you've been telling people the cards are trick cards all along. Well thought out routine with more changes than most and an ending they don't see coming. It's a fun routine, better than some later variants.